This is the second of five books of short stories about G. K. Chesterton’s fictional detective. 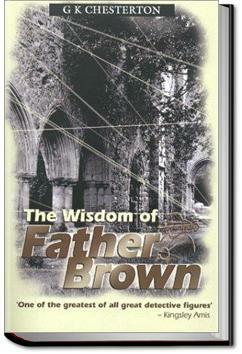 Father Brown is a short, nondescript Catholic Priest with shapeless clothes and a large umbrella who has an uncanny insight into human evil. His methods, unlike those of his near contemporary Sherlock Holmes, although based on observation of details often unnoticed by others, tended to be intuitive rather than deductive. Although clearly devout, he always emphasizes rationality: despite his religiousness and his belief in God and miracles, he manages to see the perfectly ordinary, natural explanation of the problem. He is a devout, educated and “civilized” clergyman, who is totally familiar with contemporary and secular thought and behavior. His character was thought to be based on Father John O’Connor, a parish priest in Bradford, Yorkshire. . . .rmula for powder is in grey envelope in first drawer to the left of Secretary's desk, War Office, in red ink. He must be careful. P.H.'" Oh my...how much do I love Father Brown? I don't have a crush on him like I do on Lord Peter Wimsey, but he's so wise and compassionate and unassuming that I wish he was my priest. Not that I have a priest, or would really know what to do if I did. But that's how much I like him. I so enjoy dipping into these time and again. One brief story before I have to cook supper; one story before bed. A story read out loud to change the mood of intractable children; one story to remind me again of the forgotten joy of being human.